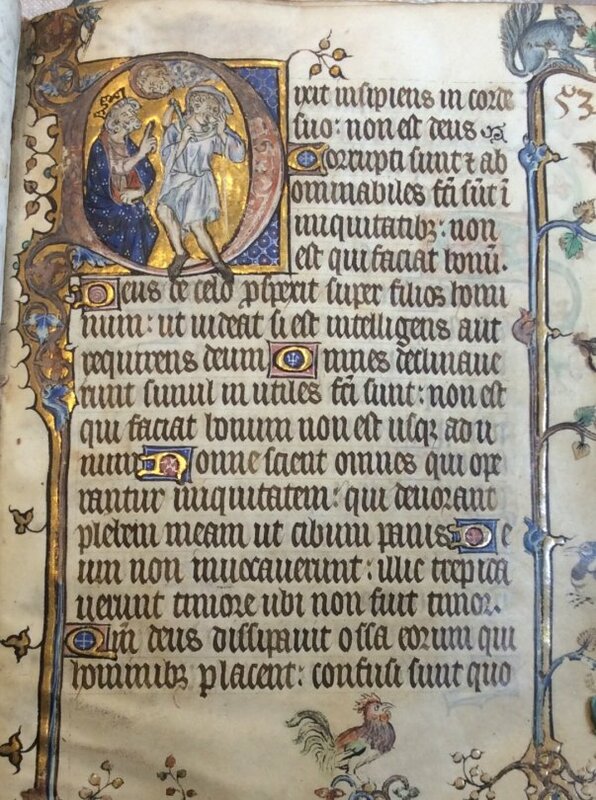 The early fourteenth-century psalter now owned by the Dr Williams’s Library was probably made for Queen Philippa of Hainault, wife of Edward III. We can be sure of this due to the presence of heraldry in the opening pages of the psalter. On f.20r, the page marking the start of Psalm 1, we see the coats of arms of France, England and Hainault lined up on the right-hand side of the page. The psalter has been dated on stylistic grounds to the late 1320s. 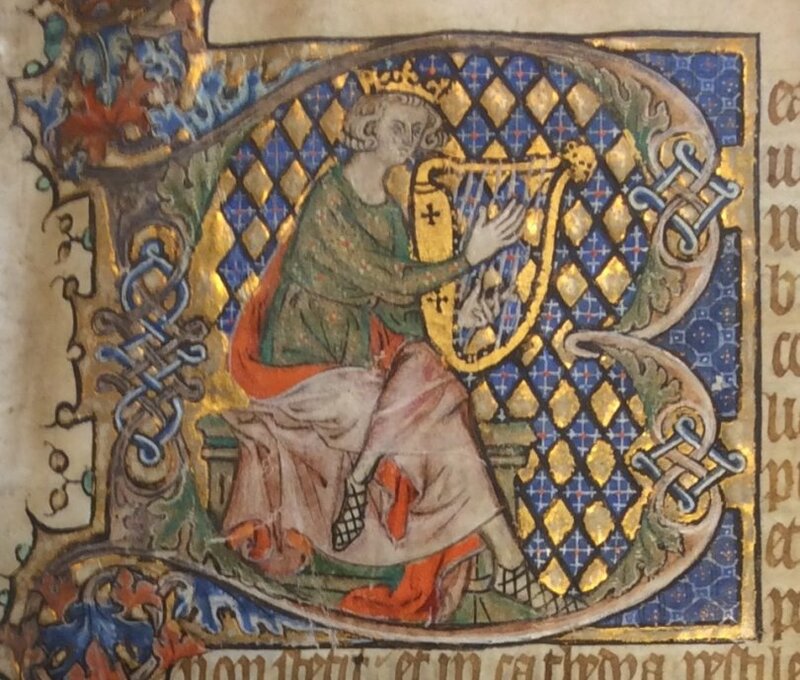 It is likely that the psalter was made as a gift for Philippa of Hainault, to mark her arrival in England and her marriage to Edward III at York Minster in January 1328. Personal psalters or books of hours were a very common wedding gift between elite medieval families. The line of heraldry seen on the right of f.20r is exactly the kind of ostentatious display of arms (at the time, Edward III claimed the French crown through his mother, Isabella of France) included in books made to commemorate grand dynastic alliances. 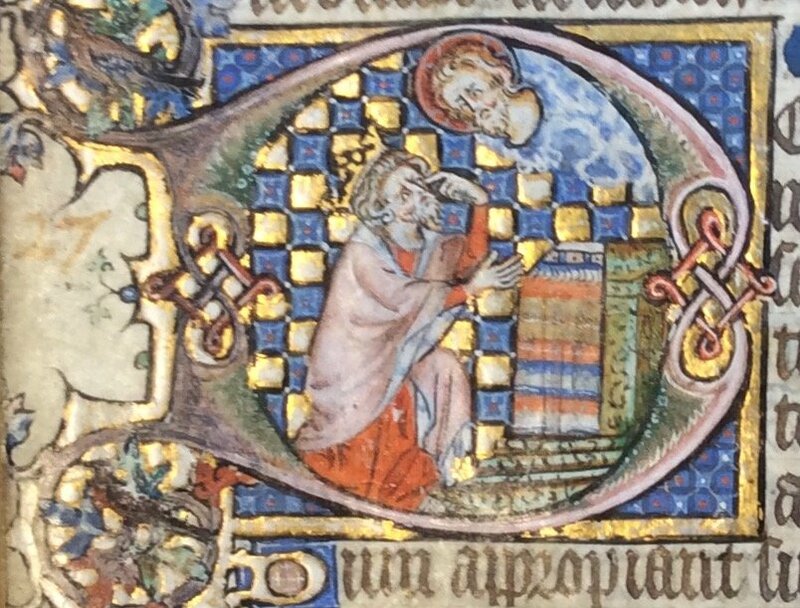 In a page intended to be used and read by Philippa over and over again, at her prayers and when she was at church, the bond between herself and her husband signified by the conjoined shields is given a spiritual as well as secular importance. The royal marriage becomes a matter of shared devotion and spiritual love, not just a strategic political union. Yet such ‘marital manuscripts’ did not neglect the more intimate side of married life. We still refer today to teaching young children about ‘the birds and the bees’. Birds and even a squirrel can be found in the margins of MS Ancient 6.
f.73r of MS Ancient 6, (with squirrel). In a medieval context, these kinds of pictures were laced with double-meanings and sexual innuendo, for squirrels and other small, furry animals were contemporary euphemisms for the sexual organs. In French fabliau, deliberately rude and comic tales popular across Europe, the desire of an innocent young maiden to kiss, cuddle and touch a squirrel is exactly the kind of dirty joke these tales revelled in. These jests are also echoed in the images found in the margins of medieval manuscripts. Other marginalia can be even ruder! Perhaps mindful of Philippa’s young age, however, the artist of MS Ancient 6 has kept things delicate and restrained. Along with the occasional squirrel are lots of fluttering birds, buds and flowers. They allremind Philippa of the ‘fruitfulness’ of a happy married life,and her duty to try and produce a healthy son and heir for her new husband.